Want to hear a great Nick Mullens story? Consult George Kittle. Last Thursday, after Mullens led the 49ers to a 34-3 win in his first-ever NFL regular season action, Kittle told a couple previously unknown anecdotes on Mullens. One of them: Mullens blasts crowd noise in his headphones whenever he prepares for games. Mullens sheepishly confirmed about 15 minutes later. On Tuesday, Kittle was at it again. When asked how Mullens commanded the huddle in his NFL debut, Kittle said the second-year quarterback was “fantastic” — before chuckling. “He comes across as serious, but sometimes he will talk to Coach Shanahan in his ear,” Kittle said. Kittle elaborated, saying Mullens told Shanahan to stop talking in the headset when Mullens needed to deliver the play-call. Kittle said it happened on the second play and continued throughout the game. The radio correspondence between coach and quarterback lasts for 25 seconds and cuts off with 15 seconds left on the play clock. Shortly after Kittle told the story, Mullens was asked about it. Mullens later complimented Shanahan for anticipating the defense’s play-calls and relaying that to Mullens. Those tips helped the second-year quarterback settle in during his near-perfect NFL debut. Mullens completed 16 of 22 throws for 262 yards, three touchdowns, and no interceptions against the Raiders. He joined all-time greats Fran Tarkenton and Jim Kelly as the only quarterbacks to throw for at least 250 yards and three touchdowns with no interceptions in their NFL debuts. As a result, he will start in Week 10 against the New York Giants. 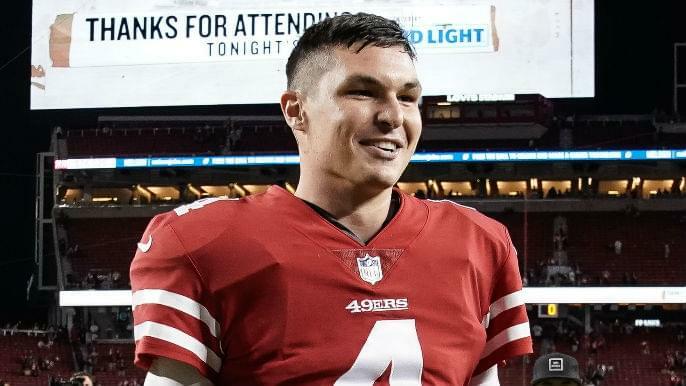 In one night, Mullens morphed from obscure practice squad quarterback to a national story on Thursday Night Football. Twitter verified him during the game. He cried after it. For the vast majority, however, Mullens was his typical calm self as he led the 49ers to their largest victory in more than four years. He put up prolific numbers and did not turn the ball over. One of the most impressive parts of Mullens’ debut: he operated the huddle well, despite never doing so at Southern Mississippi. He ran an up-tempo, no-huddle offense throughout his college career.